Legacy admissions is the status quo. It needs to end. What factors should colleges consider when admitting applicants? About 90 percent of Americans believe high school grades and standardized test scores should be a factor in college admissions decisions. Outside of academic accomplishments, many Americans believe that athletic ability, community service involvement and being the first in one’s family to attend college should be considered by admissions committees. What few Americans support, however, is favoring applicants whose parents attended that same college. So-called legacy admissions receives either major or minor support from 32 percent of Americans, but only eight percent support the use of legacy as a major factor. It is easy to understand why public support for legacy admissions is so low. Legacy students tend to be wealthier and less diverse than the general pool of applicants. Unsurprisingly, students from affluent households perform better academically and can participate in more extracurriculars than their middle and lower-income peers. But the unearned advantages don’t stop there. As of 2011, legacy status at Dartmouth grants applicants a roughly 250 percent higher likelihood of admission compared to the general applicant pool. This legacy preference is blatantly unfair, and it needs to end, starting at Dartmouth. The Ivy League still stands as a bastion of financial and social elitism. That image has lessened in recent years, but legacy admissions remains as a conspicuous holdover. While parental wealth might influence good grades and athletic ability, both of those things still require student effort, making them justifiable grounds for merit-based acceptance. Legacy status, by contrast, is purely inherited, and it heavily biases toward wealthy, advantaged applicants. Whatever one’s views on race-based affirmative action policies, which give minority students an advantage in the application process, those policies at least aim to right historical wrongs. Legacy admissions, by contrast, does not even pretend to make up for inequalities. Instead, it undermines meritocracy and perpetuates intergenerational holdings of wealth and power. Dartmouth’s traditions set it apart from other schools, and the College is right to prioritize the community of Dartmouth alumni. But part of Dartmouth’s duty to both students and alumni is to constantly better itself. Many traditions deserve preservation, but some do not. Scrapping legacy admissions practices would not destroy the alumni community, and one would think that the sons and daughters of Dartmouth would continue to give generously to the College even in the absence of legacy preferences. If alumni loved their time at Dartmouth, they should certainly still encourage their children to apply and gain acceptance based not on family name, but on their own merit. 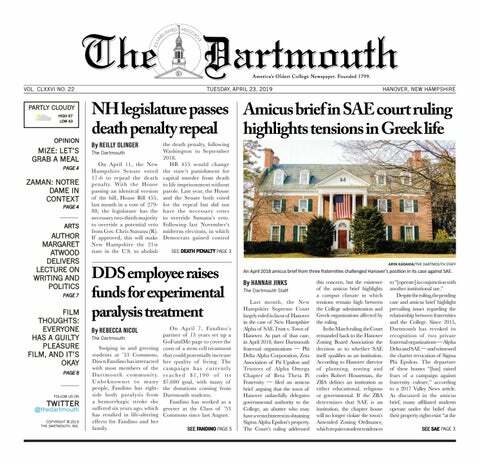 As the admissions scandal shakes people’s faith in universities and competition for a select few spots reaches record record highs, Dartmouth has an opportunity to act as a leader among colleges. It’s time that Dartmouth abandon legacy preference in admissions, level the playing field and finally begin to value merit over money. The editorial board consists of opinion staff columnists, the opinion editors, the production executive editor and the editor-in-chief.